Another popular station for us in the 1960’s was Radio Caroline. It was not always possible to tune in here in Skehana because it closed at 6.00pm and after dark was the best time to pick it up far off stations on Medium Wave. Radio Caroline was a British radio station founded in 1964 by Ronan O’Rahilly to circumvent the record companies’ control of popular music broadcasting in the United Kingdom and the BBC’s radio broadcasting monopoly. Unlicensed by any government for most of its early life, it was a pirate radio station that never actually became illegal, although after the Marine Offences Act (1967) it became illegal for a British subject to associate with it. 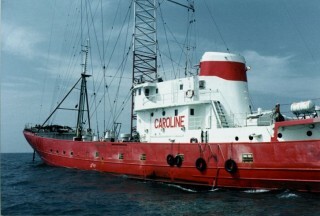 The Radio Caroline name was used to broadcast from international waters, using five different ships of three different owners, from 1964 to 1990, and via satellite from 1998 to 2013. 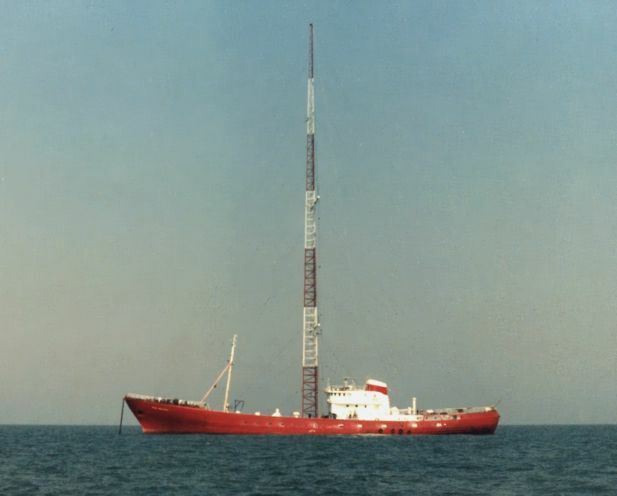 Radio Caroline currently broadcasts 24 hours a day via the internet and by occasional restricted service licence, they also broadcast on DAB radio in certain areas of the UK. Radio Caroline broadcasts music from the 1960s to contemporary, with an emphasis on album-oriented rock (AOR). 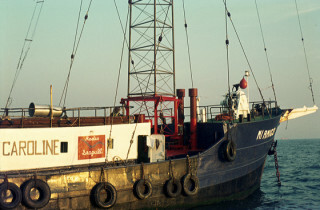 The company also licenses other stations around the world to use the Radio Caroline name. Radio Caroline was begun by Irish musician manager and businessman Ronan O’Rahilly. O’Rahilly failed to obtain airplay on Radio Luxembourg for Georgie Fame’s records because it was committed to sponsored programmes promoting major record labels; EMI, Decca, Pye and Philips. Encouraged by Scandinavian and Dutch pirates, in February 1964 O’Rahilly obtained the 702-ton former Danish passenger ferry,Fredericia, which was converted into a radio ship at the Irish port of Greenore, owned by O’Rahilly’s father. At the same time, Allan Crawford’s Project Atlanta was equipping the MV Mi Amigo at Greenore, where the two competed to be the first on air. Financial backing for the venture came from six investors, including John Sheffield, chairman of Norcross, Carl “Jimmy” Ross of Ross Foods, Jocelyn Stevens of Queen magazine, with which Radio Caroline shared its first office. O’Rahilly named the station after Caroline Kennedy, daughter of U.S. President John F. Kennedy. On a fund-raising trip to the US, O’Rahilly reportedly saw a Life Magazine photograph of Kennedy and his children in the Oval Office that served as the inspiration for the name “Caroline Radio”. In an extant photo, Caroline Kennedy and her brother, John F. Kennedy Jr., are apparently dancing in the oval office as their father looks on, an activity which O’Rahilly reportedly interpreted as a playful disruption of government. The Fredericia was renamed MV Caroline and anchored off Felixstowe, where it began test transmissions on Friday, 27 March 1964. On Saturday, 28 March, it began regular broadcasting at noon on 197.3 metres (1520 kHz, announced as 199 metres) with the opening conducted by Simon Dee. The first programme, which was pre-recorded, was hosted by Chris Moore. Radio Caroline’s first musical theme was Jimmy McGriff’s “Round Midnight”, a jazz standard co-composed by Thelonious Monk. In March 1964, The Fortunes recorded Caroline, which became the station’s theme. Round Midnight was confined to close down on Radio Caroline North after The World Tomorrow. The station’s slogan was Your all-day music station, and it initially broadcast from 6am-6pm, seven days a week. Radio Caroline announced a wavelength of 199 metres, rhyming with the name, but was actually broadcasting on 197.3 metres (1520 kHz). Stations in the UK announced the wavelength in metres, and radios at that time were tuned using an analogue dial. The absence of precise digital readouts allowed for some leeway between the precise transmission frequency and the channel announced on the air. The Dutch offshore station Radio Veronica was on 192 metres (1562 kHz) and Radio Atlanta broadcast on 201 (1493 kHz). Radio Caroline’s transmission output was almost 20 kW, achieved by linking two 10 kW Continental Electronics transmitters. Broadcasting hours were 6am to 6pm to avoid competition from Radio Luxembourg. After its close-down, the station returned at 8pm and continued until after midnight. This was to avoid competition with popular television programmes. Most of Radio Caroline’s pop music programmes were targeted at housewives, and some later programming was aimed at children. 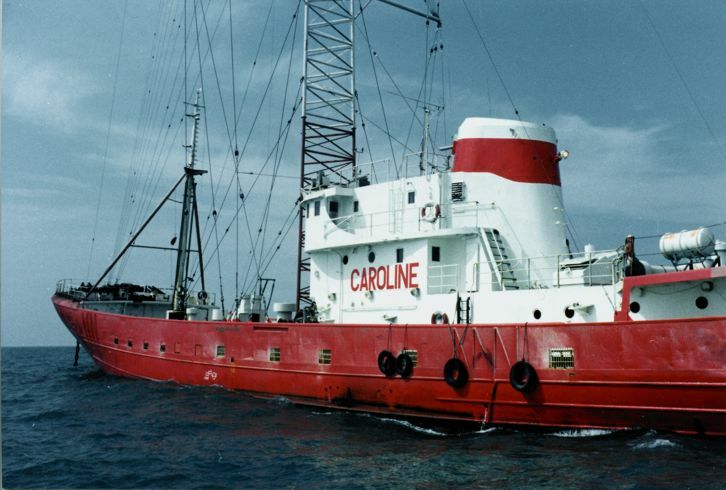 Without serious competition, Radio Caroline gained a regular daytime audience of some 10 million. On 2 July 1964, Radio Atlanta and Radio Caroline’s companies, Project Atlanta and Planet Productions., announced the stations were to merge, with Crawford and O’Rahilly as joint managing directors. Radio Atlanta closed at 8pm that day. It was renamed Radio Caroline South and MV Mi Amigo remained off Frinton-on-Sea while MV Caroline broadcast as Radio Caroline North. MV Caroline sailed from Felixstowe to the Isle of Man, broadcasting as she went. The only broadcast staff on board were Tom Lodge and Jerry Leighton. MV Caroline arrived at her new anchorage in Ramsey Bay on 6 July 1964. The two stations were able to cover most of the British Isles. Later, some programmes were pre-recorded on land and broadcast simultaneously from both ships. 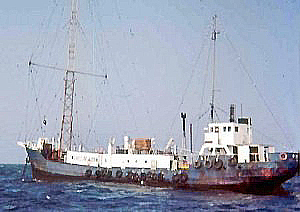 In October 1965, O’Rahilly bought Crawford’s interest in the MV Mi Amigo and engaged Tom Lodge from Radio Caroline North to make programme changes and regain the audience from Radio London. Lodge hired new DJs and introduced free-form programming which, by August 1966, had succeeded, creating an audience of 23 million. When the US-backed Radio London arrived off the coast of England, there was an unsuccessful attempt to merge its sales operation with that of Caroline before Radio London started transmissions.. The new station introduced British audiences to slick American-style top 40 radio with electronic jingles produced by Dallas-based PAMS – and was an immediate success. 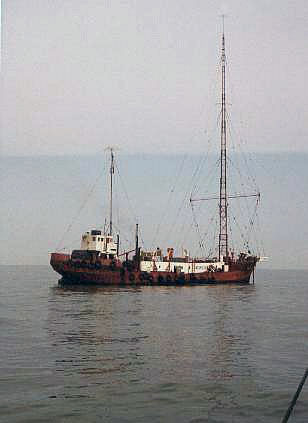 Radio Caroline’s first programme, on 28 March 1964, was presented by Chris Moore. Presenters Tony Blackburn, Roger Gale, Mike Allen, Ray Teret, Roger Day, Simon Dee, Tony Prince, Spangles Muldoon, Keith Skues, Johnnie Walker, Robbie Dale, Dave Lee Travis, Tommy Vance, Paul Noble, Bob Stewart and Andy Archer became well known. Some DJs from the USA and Commonwealth countries, such as Graham Webb, Emperor Rosko, Steve Young, Keith Hampshire, Colin Nicol and Norman St John, were also heard. DJ Jack Spector, of the WMCA “Good Guys” in New York, regularly recorded for Radio Caroline. Syndicated shows from the US and recorded religious programmes were also broadcast. BBC Radio 2 newsreader Colin Berry and Classic FM’s Nick Bailey started their careers reading the news on Radio Caroline South. In mid-September 1965, the crew and DJs on MV Mi Amigo were joined for the weekend by 1960s pop singer Sylvan Whittingham, who visited the ship to promote her single “We Don’t Belong”. Whittingham was unable to leave on the tender when a storm arose. The only singer to stay overnight, she helped present programmes, make jingles, and close the station at night. This page was added on 27/03/2017. Hello, I read your blog and I am also in love with the old pirate stations. I too tuned into Caroline in my youth. I am trying to get more information on the people who manned and operated these great stations of the past. My search has been long and it’s driving me crazy so any assistance is very much appreciated.